Pressure washing sounds like a satisfying job to do at home. But don’t get too excited about it. Reckless pressure washing may do more harm than good to your precious home. That would make for a terrible day, right? To help you stay out of the dog house, we’ve listed 11 things that you shouldn’t pressure wash and why. Learn more below. There’s a way to properly pressure wash your wood siding, but there’s actually a good chance that water will find a way under the exterior surface. You don’t want water getting behind your siding! If this happens, water can damage insulation, electrical wiring, and it can cause mold growth. Using a high-powered pressure washer can also create dents on aluminum and vinyl sliding. If you need to wash your siding, it’s best to contact a professional cleaning company. Electricity fixtures, even the ones installed on the outside of your home or yard, should NEVER be pressured washed. High-powered pressure washing can force water to enter into cracks and crevices and this may cause a dangerous situation or force you to spend on repair work. Remember Louie the Lightbulb? Be that guy and play it safe! A roof with asphalt shingles should never be pressure washed. Doing so will remove the granules that are important for protecting your roof against damage. It’s also very dangerous to use a pressure washer in a high place. The powerful recoil on the spray wand can throw you off balance and off a ladder once the trigger is squeezed. Be safe, and don’t attempt anything dangerous. If you need help removing debris from your roof, it’s best to let a local contractor specialized in roof maintenance do the work. It’s just too dangerous to DIY because a pitched roof and running water are a recipe for disaster without safety equipment. There are still a few homes around Birmingham where lead paint is an issue. Lead paint shouldn’t be removed with a pressure washer at all. It should be carefully contained when removed and not spread into the air and surrounding surfaces. If you suspect lead paint in your home, contact a professional and get it tested to be certain. Landscaping surfaces and old brick houses can be damaged by pressure washing. Loose materials on old structures will be blasted away by pressure washing. It’s best to not risk costly repairs and rely on low pressure water combined with a ratio of bleach. Really? Do we need to discuss this one? But for precautionary measures, please, please, please don’t pressure wash humans, pets or plants.Pressure washers are not toys! The force of the water can cause physical harm and can even penetrate the skin. And obviously, it will destroy your plants. If you’re pressure washing appropriate places, don’t forget to wear safety glasses to protect your eyes from debris. Safety is your #1 priority when you’re working around the home. Pressure washing chips paints off easily from most surfaces. So be sure to use only low-pressure flow of water to wash painted surfaces. Pressure washing your windows can break the glass. Period. If you break the glass, you’ll have to call a local contractor like Oak Mountain Glass. So it’s a big no-no. High pressure washing can cause small dents and chip to the paint on your vehicle, making it prone to rust. If you really want to pressure wash your car, be sure to use set it to a low-pressure setting. And never pressure wash under the hood. Water can enter into cracks and crevices and can cause serious damage. Drive-in car washes with the pressure wands are set to a lower pressure setting, and that’s a better option than using your pressure washer you keep in the garage. 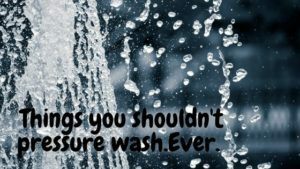 Though these fixtures are built to withstand rain and other outdoor phenomena, it’s not advisable to pressure wash them because water can enter into cracks and can cause damage. If you want to keep the stain on it, don’t pressure wash it. We hope you found these tips helpful! If you need help with pressure washing around the home, don’t hesitate to call. We’re a local pressure washing company in Pelham serving Birmingham and the surrounding areas.